Steve Foster, the man behind Grandma Foster’s Bar-B-Que Sauce, named the sauce after his grandmother, Lilley, who lived in Plainview, Nebraska. Steve grew up knowing that Grandma Foster was a fabulous cook which had an impact on him. Because of her influence, he developed a sauce that has an all-natural, robust flavor that young and old appreciate. A sauce Grandma Foster would be proud of. Grandma Foster’s Bar-B-Que sauce was launched in 1996 and was initially offered in a few select Omaha Hy-Vee grocery stores. As more people tried it, the sauce’s popularity exploded. 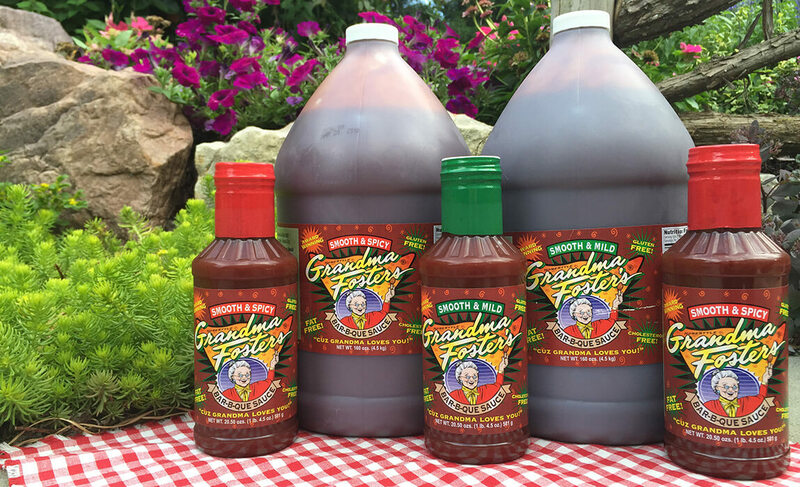 Restaurants, caterers and competitive barbecue teams across the country became avid fans of the sauce and Grandma Foster’s began to receive a long list of prestigious awards. The sauce currently has distribution in nine states and recently was signed by Amazon for worldwide direct distribution. Consumers choose Grandma Foster’s not only because of its world-class taste, but because it is fat free, cholesterol free and gluten free. A portion of the profits go to support inner-city youth. Grandma is excited to share her sauce with you and your family.